The flexibility and efficiency in the active control of liquid processing as obtained by the SpinChip dual axle centrifugal concept are game changing within lab on a chip microfluidics. When this fluidic system is combined with the additional features listed in the technology chapter this opens for making a true quantum leap within advanced and ultrafast multianalyte point of care in vitro diagnostics. A unique high sensitivity assay cartridge format for the measurement of high sensitivity cTnI using beads as solid phase and a unique fluorescent nanoparticle tracer substance. This cartridge format will make the base for other high sensitivity assays including assays for NT-pro-BNP, TSH, PCT, IL6, and other proteins present in low concentration in the samples. A membrane flow through assay concept combined with gold colloids as tracer substance for the measurement of CRP (both the hs-CRP range and regular CRP range). This cartridge format will make the base for assays such as D-Dimer, Ferritin, Calprotectin and other proteins present in relatively high concentrations in the sample. The cTnI assay with targeted sensitivity range from less 1 ng/L to above 10.000ng/L as measured in 14µL blood from a fingerstick within less than 10 minutes is planned launched in 2022. SpinChip’s pilot application is a high sensitivity troponin I (hs-cTnI) test. 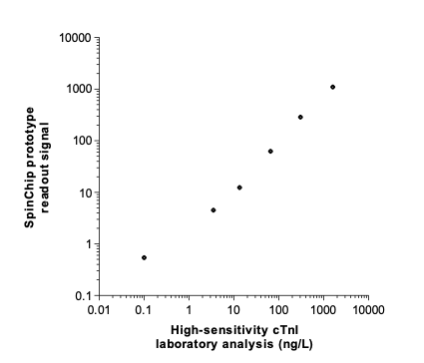 The figure below shows data from a SpinChip hs-cTnI prototype cartridge as compared to a high-sensitivity laboratory test. The SpinChip prototype uses 6 μL plasma sample (spiked with troponin) and is automatically processed and read within the SpinChip instrument with an assay time of less than 15 minutes. The SpinChip technology is further applicable to and will bring added value and efficiency into several other methodology fields including haemotologic methods (flow cytometry like), a variety of clinical chemistries and molecular diagnostics. Sample processing including homogenisation, extraction and separation steps of for example tissue or faecal samples could be performed extremely efficient within sealed cartridges. The company’s present focus is on human in vitro diagnostics, but there is a large potential in other fields such as in veterinary diagnostics as well as in other point of use analyses or in other applications requiring advanced fluidic processing.